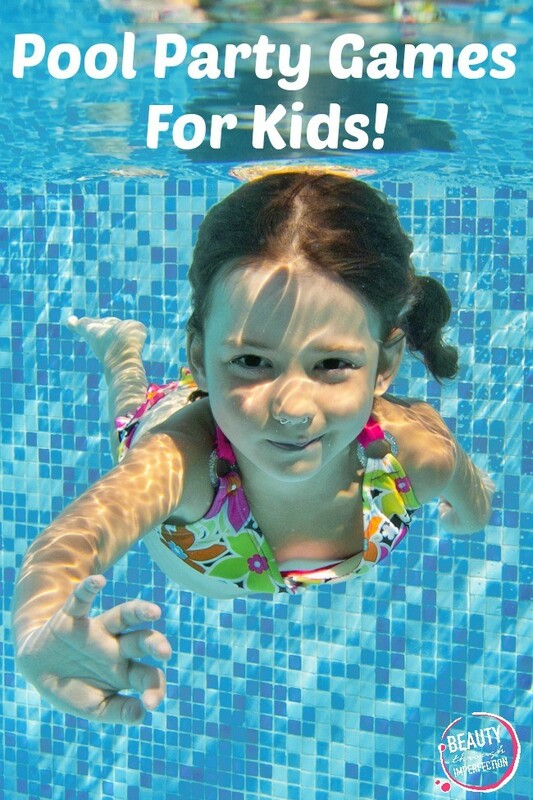 Pool party games can really help kids have more fun at a pool party! Instead of sitting on the edge of the pool, they can all enjoy the party together with these fun pool games! My sister asked if I would be in charge of the party games at her son’s pool birthday party this year. 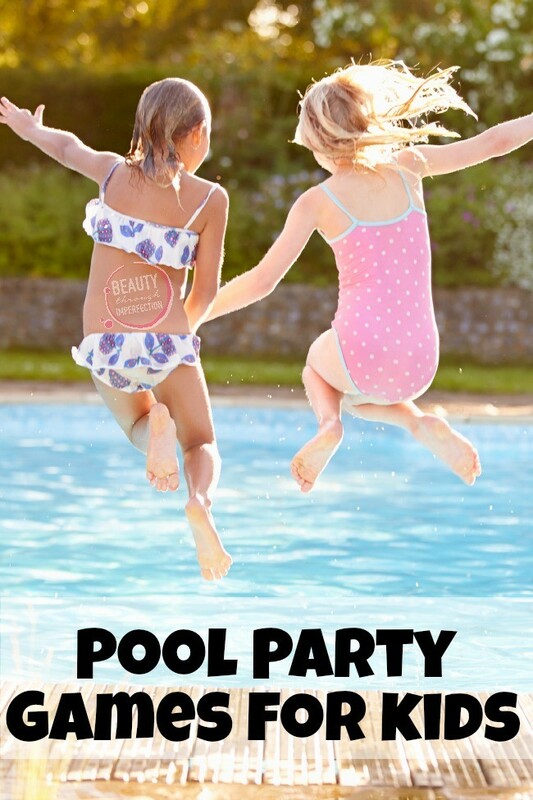 We wanted to think beyond the traditional pool games everyone already knows like Marco Polo and find some fun pool party game ideas for kids. 1) Treasure hunt. I checked to make sure all the kids at the party were able to swim, so this first game would work. I took a bunch of pennies and nickels out of my coin jar, made the kids gather on one side of the pool facing the other way, and then tossed the coins in the water. They screamed and laughed as they raced around gathering their treasures. They collected them all, we counted and announced a winner. Then as I put all the coins in a bowl, I “accidentally” let them scatter back into the pool, and we did it all over again. 2) Super cannonball contest. Just like it sounds, we had the kids line up, to see who could make the biggest splash off the diving board while doing a cannonball. We selected a couple of parents to pick a winner, and I had to hide my laughter at how seriously the judges took their duties – they had several discussions before choosing the biggest splash. The winner got a prize, and the smile on her face was a joy to see. 3) Submarine races. The kids lined up on one side of the pool, wearing goggles we provided. When we yelled “go” they saw who could swim the longest under water. They were swimming side to side in the shallow end, so we could keep track in case anybody had a problem, and it was astonishing to see how far these kids could swim. One boy went back and forth across the pool twice – he was of course declared the winner, and the parents all laughed at how big he smiled! 4) Invisible bottle. I was really surprised at how much fun the kids had with this one. I took a pint water bottle with a white cap (we had to give them something to look for) and filled it with water from the pool. I had the kids line up on one side of the pool facing away from it. Their signal to “go” was when they heard the bottle hit the water. There was a lot of swimming and exploring before finally someone found the bottle. I thought they would want to do this one once, but it was like throwing a tennis ball for a golden retriever – they kept me throwing that bottle until I finally had to get someone else to do it for me. They loved it! 5) Pool tag. One child was chosen to be “it” in the middle of the pool, and everyone else started out against one wall. The object was for the kids to get to the opposite wall without being tagged. When the game started, “it” closed his or her eyes – and kept them closed through the game, and yelled out either “dolphin,” for the kids to swim above the water, “submarine” for them to swim underwater, or “froggy” for the kids to stay in the middle of the pool. Those who made it yelled “survivor.” The person who got tagged became the next “it.” They played this game for a long time. 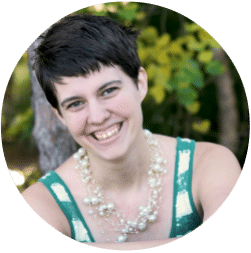 Author Bio: Kaitlin Gardner started AnApplePerDay.com to further her passion for a family friendly, green living lifestyle. She is married to her best friend and lives in Pennsylvania. In her spare time, she loves to go hiking, biking and enjoy nature. She just started her first book about living an eco-friendly, healthy, natural lifestyle. These sound like fun for adults too! I can’t wait for summer and pool parties! 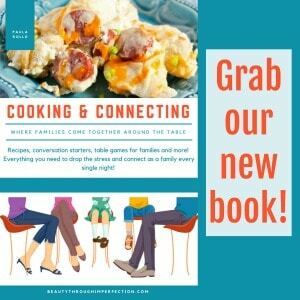 I’m glad I found your post through the Show and Share link party. The pool game, Invisible Bottle, is really fun game. It makes more interesting when the kids are not able to see it at first sight. Another good option is Pool Tag. When the crowd chorus “dolphin” & “submarine” & the kids follow the instructions while swimming, it makes atmosphere entertaining & lived. These are indeed the best moments of life to memorize. Thank you for taking an effort to share such games here. 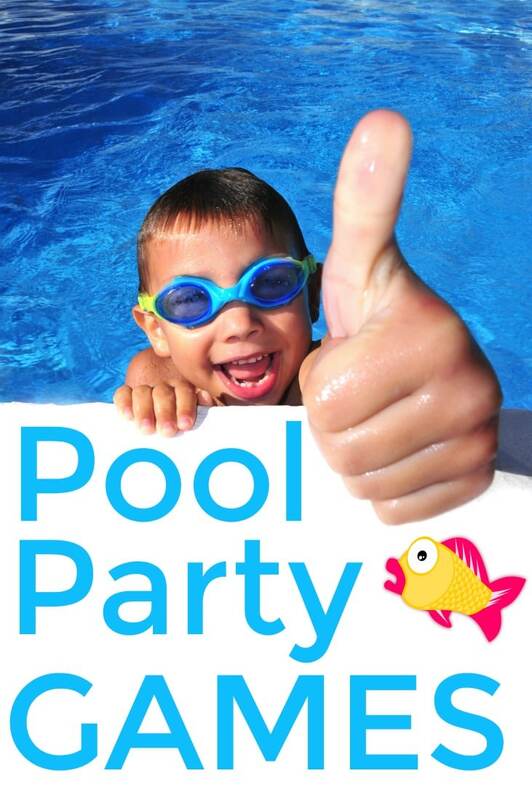 Much better try a remedy for a month or so and then go for yet another 1.
pool party games is a great idea for our children to enjoy the celebration even more.